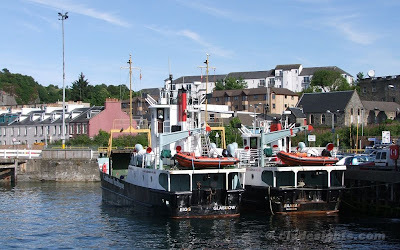 Two of CalMac's larger vessels were seen together at Oban. 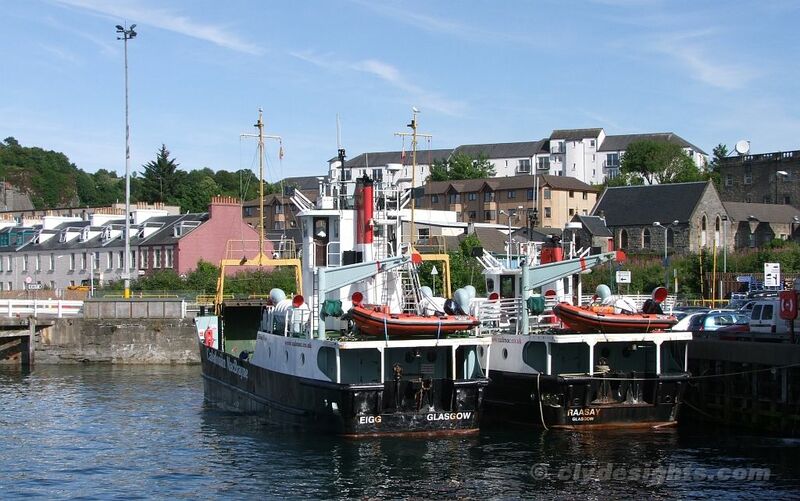 LORD OF THE ISLES (right) was busy loading for a late afternoon sailing to Colonsay while HEBRIDEAN ISLES was doiong her best to cope with an amended version of CLANSMAN's roster, while the latter was still undergoing repairs at Greenock following a serious machinery breakdown. HEBRIDEAN ISLES was sailing for Castlebay and would return to Oban at 0600 the following morning. Lying at their own berth beside the fish quay, the small 'Island' class ferries EIGG and RAASAY were waiting for their next duties. EIGG would not have long to wait as she was getting ready to cross from Oban to Lismore - she is the island's principal ferry and makes up to five return sailings each day. She had her wheelhouse raised a number of years ago to improve visibility forward, a modification that makes her unique amongst her sisters. RAASAY spends most of the summer lying idle as she is relief ferry for the run although in winter she is fully employed on other routes.